Diatonic pitch shifters track the notes that you’re playing and shift the pitch by the selected harmonic interval based on the Key and Scale that you’ve selected. 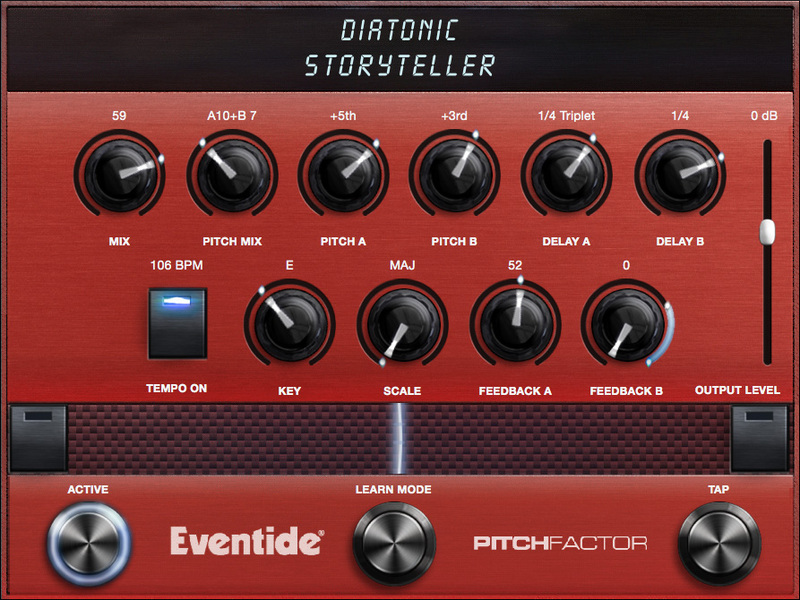 Diatonic Shifter features twin independently-controlled pitch changers (A & B) with independent delays and feedback. Diatonic tracks the notes that you’re playing and automatically adjusts the amount of pitch shift so that the resultant note is in-key. Use the Pitch A/B control knobs to set each pitch interval. Use the Control Knobs to select the key, scale and interval. Using H9 Control (or if you’ve connected an AUX Switch), you can use Learn mode to set the key. See SYSTEM Mode section of the H9 User Guide for details on setting up an AUX Switch. Note: Due to the limitations of Diatonic Pitch Shifting, the pitch tracking algorithm is monophonic and works best on single, isolated notes, and octaves. Controls the ratio of the level of Pitch A to Pitch B.Note: The A/B mix is set before the feedback delays so that feedback can continue on A or B and not be affected by new audio when the Pitch Mix control is turned completely to the opposite channel. This allows you to create a mini 'looper' effect. Selects the scale. The supported scales are: [MAJ]-Major, [min]-Minor, [DOR]-Dorian, [PHRG]-Phrygian, [LYD]-Lydian, [MLYD]-Mixolydian, [LOC]-Locrian, [Hmin]-Harmonic Minor, [Mmin]- Melodic Minor, [Wton]-Whole Tone, [ENIG]-Enigmatic, [NPLT]-Neapolitan, [HUNG]-Hungarian. Controls level of voice A Feedback. The feedback delay length is the length of either Delay A or Delay B, whichever is longer. Controls level of voice B Feedback. The feedback delay length is the length of either Delay A or Delay B, whichever is longer. Press and hold the Learn switch while playing a note and the H9 will set the key to that note..